Students in two upper-level writing classes were the core reporters behind the New Mexico News Port project at the University of New Mexico in the fall 2014 semester. Photo by Derrick Toledo/NM News Port. This piece was co-authored by Michael Marcotte. As UNM students returned to classes this spring, many brought the new confidence and ideas they earned last fall by launching the New Mexico News Port, a collaboration spawned by the Online News Association’s Challenge Fund for Innovation in Journalism Education. "Our 'learn by doing' philosophy exposed a rather sharp contrast to the 'learn by watching, discussing and practicing' approach more typical in journalism classrooms." As described in an earlier post, the two of us designed a live news experiment that seated itself in the journalism school curriculum, involved various external partners, and took aim at statewide election coverage as its initial content focus. It was a radical and ambitious undertaking for a small department divided by communication and journalism studies. We have lived to tell of it. By the end of the term, some 50 students from six classes had contributed more than 100 stories, produced more than 25 videos, carried out a Twitter Town Hall, and sustained an active social media engagement effort. So what new knowledge did students acquire? And what did we journalism professors learn? We’ve been sorting that out, and some of the answers surprised us. The first five insights are from Mike Marcotte, the project’s coordinator, while the second five are from project editor Kate Nash Cunningham. 1. The sudden implementation of a “teaching hospital model” can temporarily overwhelm students. Our “learn by doing” philosophy exposed a rather sharp contrast to the “learn by watching, discussing and practicing” approach more typical in journalism classrooms. This sudden shift in the curriculum shocked some students. Suddenly, the the deadlines were harsher and the bar was higher for the rigor of their work. To deliver publishable content, they had to summon a good deal of will, time and effort. Had the News Port existed previously, students would have seen it coming up ahead in their curriculum trajectory and that would have provided them some advance notice. As it was, in debuting something this fast, they had to sink or swim. Take away: Was this a one-time shock only? Was it amplified by the nature of election coverage? I think the answer is yes to both. 2. Why was I exhausted by December? Because the “teaching hospital model” requires more editorial leadership and editing capacity than a typical academic course. Take away: Train good student editors to help edit. (Peer edits by themselves don’t do much good.) Also, look for editing assistance from the professional partners. Sadly, as a last resort, we relented on the notion that all stories must clear the publishing bar, and we allowed less motivated students to opt out of publishing by settling for a lower grade and skipping extensive rewrites. It’s true, the more you demand, the more you will get. For the students, that means the greater the struggle, the greater the triumph. At the start of the semester, there was widespread student concern over the real-world expectations of the News Port. Kate and I calmly watched and endured spasms of fear and panic. Gradually, that gave way to satisfaction and confidence. Almost all students ended the semester feeling gratified that they had prevailed. (See sample comments below.) They got those hard-to-get interviews. They actually got stories published. They really did meet professional standards. And though they started out with large gaps in knowledge of politics, they filled those gaps and became well-informed “experts” on their beats. Take away: One of the hardest things to teach in journalism is the value of persistence, unless the student experiences both the challenge and the pay off. Set a high bar and remain encouraging despite the initial whining. 4. The gap between students and professional partners is still pretty wide. Despite our best efforts to close the gap, it’s not easy to bridge the work of aspiring journalists with all the needs of our publishing partners. We found very good connection with the Daily Lobo, the independent campus newspaper, because it shares so much in common with the campus culture. But our supportive friends at founding partners KUNM, KNME and New Mexico In Depth remained somewhat distant from the classroom efforts. We can’t blame them for taking a back seat as we figured out how to drive the car. Plus, we are thankful for the ongoing encouragement they offered, not to mention the content sharing they provided the News Port. But, our goal should be to close that gap, and I think getting our professional pals more involved, early on, in planning and execution of student work is one way. Not that we’d expect a lot of student work to end up on their platforms, but that we’d identify select students and select works that the partners actually supervise through to completion … even if it takes longer. Take away: Bridge the classroom-partner gap with targeted opportunities worked out between faculty, pros and students themselves. 5. Allow for checks and balances between the classroom and the publishing platform. If I were both classroom teacher and News Port editor, not only would I have gone mad but my editor self would probably concede shortcuts to my teacher self. Fortunately, I didn’t face that problem because I was able to hire an excellent editor in Kate. This allowed me to keep my eye on the classroom students and their activities, while Kate kept an eye on the publication and the needs of the community, the audience. Also, it just helped to have the additional expertise. Kate’s combination of journalistic, design and teaching sensibilities were instrumental in moving the project from concept to reality. It took a lot of work, and that took high levels of motivation and commitment on her part. I’m exceedingly grateful for that. Take away: The more we can specialize in our roles, the better we can balance the needs of pedagogy with the needs of industry, and of public service. A look at the key lessons students learned as part of the New Mexico News Port project. Our topic, the statewide and midterm elections, was pretty specialized and in retrospect not a theme to which many students were attuned. Early on, students needed coaching on the differences between the U.S. House and the state House and how campaign finance laws and other election minutiae work. Turns out such topics generally aren’t on the radar screen of students, as some mentioned in class reflection essays at the end of the 16 weeks. One helpful speaker during the semester was Eve Byron of Followthemoney.org, who flew in to talk to students about using the group’s website to understand and report on campaign finances. We should have dedicated more time to having political scientists or candidates come to class, and we probably should have assigned more reading dedicated to the democratic process. We also might have provided many more examples of the types of political journalism we were seeking, so students had context for the standards and quality for which we were aiming. Overall, though, we chose the election not only because it was the biggest story in town during the semester, but also because it’s a topic many beginning journalists will be asked to cover during their time with news organizations. Throwing them into something they know little or nothing about is par for the course in journalism. In the end, several said they were glad to have learned more about the political process while others said they still didn’t love politics, but were grateful for the experience of covering something about which they knew so little. Take away: Gauging student interest in a topic ahead of time is key, as is making sure students have an academic understanding of the theme on which they will be reporting. A thanks here to ONA and its funders for providing us the money to run the grant. And thanks to our local public radio station news partner, who provided funding for a work-study student. As generous as our partners were, we could have used more hands on deck to help with several points, including a full-time web developer and assistant editors. We already are doing more to recruit credit- and internship-seekers going forward. Understanding what we could do with a staff of a few also is helping us plan as we write new grant proposals to keep our project going. In terms of the work that we would have liked to focus on more, key topics include our website. A shoutout here to all those folks designing news web sites and doing it well. We faced design challenges including how to think about story placement and how often to change the front page, and how to treat breaking news on election night to keep our site lively and competitive. We also grappled with technological logistics and may have underestimated the need to ramp up students’ tech knowledge about document management, data visualization tools and video editing and compression. As with many techy things, we needed to be more explicit and explain best practices for the tools we chose, including Google Docs. Take aways: Knowing what you can do and what you can teach helps diagnose where outside resources might be key. If you want a custom website, for example, find a way to chip in for a smart graduate student in computer science. Looking ahead, we might require students to use software tutorials such as Lynda.com outside of class, as well as providing more hands-on training. 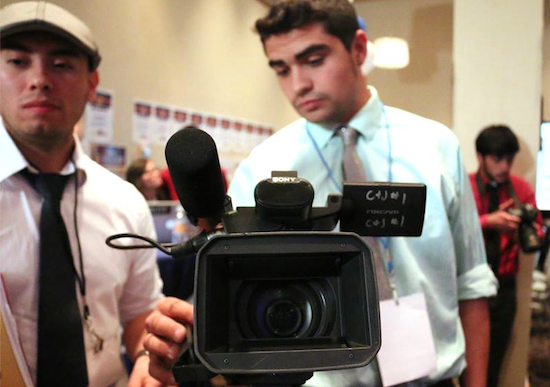 University of New Mexico students Robert Salas, left, and Travis Gonzales, contributed election night content to the New Mexico News Port. Photo by Micaela Eldridge-Lane / NM News Port. Because we hit the ground running so close to the November elections, we could have used more time reach out to fellow instructors in the department. We could have spent more time recruiting partners across the state and in Albuquerque. But we lucked out with a fantastic core of supportive faculty and of local partners including the public radio and TV stations, the independent student newspaper and an online investigative reporting site. All of our partners were dedicated to our core mission of teaching journalism by doing journalism. Because we coalesced around the election, it was quite easy going in and identifying content we could share. But cross-newsroom collaboration is tricky when many newsrooms themselves struggle to plan for big events. On our end, we could have planned our story schedule a bit better and communicated more than we did. One of the challenges we faced was knowing exactly when we could provide student-generated content we had planned out because of the need for revisions and additional reporting. We also lacked an easy way to build a unified story budget document that easily shared, described and organized all upcoming content from partners. Post-election meetings with partners revealed a desire to publish more stories that could have been reported and worked on by more than one news outlet, instead of each outlet producing content that was shared on another partner’s site. Take away: The question here wasn’t so much what to communicate about the project, but how. We searched for but didn’t find a software or a system option we liked for planning and budgeting stories three or four months out. We stuck it out with Google Groups and weekly updates, meetings and phone calls, but this was a sticky wicket in the overall workflow with students and partners. This is in the obvious category for sure, but it’s worth mentioning, because it helped keep us humble when things didn’t go perfectly. We all know real newsrooms are not the stuff of movies. (Although some newsrooms would make interesting sitcoms.) Instead, our train moved slowly along the track a few more times than we would have liked. At times, we got detoured by simple workflow issues. Sometimes we had two editors in a piece at the same time, while at other times we had students creating different versions of the same Google Doc and creating a confusing mess of old and new versions. Other times we suffered from bottlenecks of too many stories due at the same time. Other times, we got rerouted by student deadlines that weren’t met, which we used as learning opportunities to explain that deadlines missed in the real world might mean a job lost. Other factors that slowed us down were the expectations that students produce work just as professionals do, and get in-person interviews, for example, and not quotes from other news outlets or YouTube videos. Several of the challenges we have mentioned might have been solved with more time. But that’s no excuse. Instead, we saw it as a chance to choose what to do — and what to set aside. We didn’t have an animated logo or the fanciest website in town, and we didn’t get each student proficient in WordPress, and that’s OK. We oversaw many students being published for the first time and saw our budding journalists grow their skills and confidence. Take aways: Study up on what successful newsrooms and other startups do and have done. But don’t get bogged down in your missteps and missed stories. Give yourself permission to try new things and pivot when they aren’t working. With flexible minds, we were able to triage our immediate tasks such as getting debates covered while trying to plan ahead on the side. Along with the debriefs we held with our partners after the election, we sought feedback from the students in our core participating classes. The lessons they learned were key to how we envision the second semester of the project. Our approach to student feedback was one of encouragement and openness. Mike would often open his class period with the question, “How are we doing out there?” (Which sometimes led to a spate of venting, such as “we’re not professionals” and “no one is calling me back!”) It was freely acknowledged that we were embarking upon something new and different, and that we were all in the discovery process together. Other feedback came that at the end of the semester showed that the students grew in personal and professional ways. Some said they came to understand the political process better, while others developed more self confidence and many strengthened their reporting and writing skills. Kenneth Ferguson, a senior and journalism major, said he walked away with a stronger knowledge of politics. Rachael Rivera, a journalism major, said she learned about what to expect when working with a professional editor. Michael Warren, a senior, said he really enjoyed the work of election night. Mia Clark, a senior, said she learned about pride in authorship.